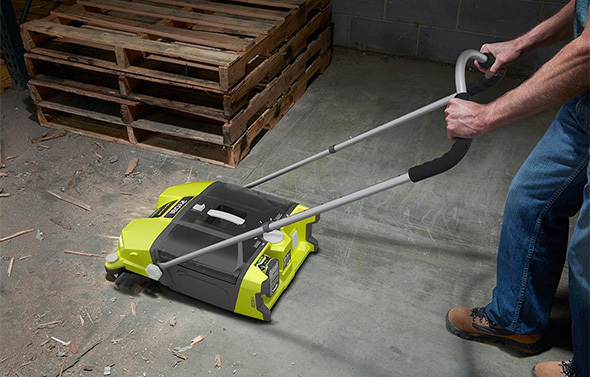 Ryobi has come out with a new 18V One+ cordless 6 gallon wet/dry vacuum, model P770. I unboxed my test sample yesterday (courtesy of Ryobi), and used it for a couple of quick cleaning tasks. I paired it with a Ridgid auto detailing accessory kit I bought from Amazon last week, and later used it with the included accessories. While I continue testing it for formal review, what questions would have me try to answer? I’m already trying to work on a runtime assessment. This vac has an unusual design, especially for a cordless model. There are 2 large wheels, at the center, and swivel casters at both ends. There’s a large top handle, bottom grab handles, and fantastic on-board accessory storage. On-board accessory storage is accomplished using bungee cord. It works superbly well, and there are even extra loops at the rear for other storage accessories you might have. The included hose is 1-7/8″, which is much larger than 1-1/4″. 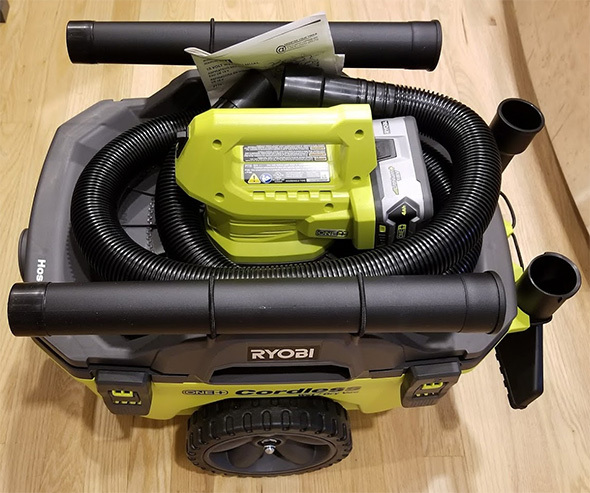 It’s not 2-1/2″, but it’s a good size, And you can swap in a larger hose if you want, since Ryobi built the vac with a standard inlet port. The included 7′ hose is a lot like the Ridgid hose I used it with, featuring a small tab that latches onto the inlet port. This means you could tug it along without much worry about the hose pulling itself free from the vacuum. It also comes with 2 extension wands, a crevice nozzle, a wide nozzle, and a cartridge-style filter. One nice touch is that the cartridge-style filter remains in the collection based when you remove the top for emptying. That makes it a little easier to set the lid down, and to remove the filter in a more controlled manner. Translation: it’s not as messy as other vacs can be. The inside of the vac has a lot of nooks and crannies that might be a little difficult to clean, so try to use another vac for the nastiest of messes. Maybe there’s a way to fit this vac with a collection bag? This Ryobi 18V One+ vac is unlike any other cordless vacuum I have ever used. It seems to be perfectly well thought out, with great attention to user friendliness. Even the flat-top storage section works spot-on for taming the included hose! So far, around 10-12 minutes in 4 interrupted sessions drained a fresh 4.0Ah battery pack down to 2 bars. I have some more cleaning up to do today, after which I’ll think about how to do some runtime testing. My only complaint about the vacuum would be its shrilly motor noise, but the same is true of all shop vacuums. Ear plugs or earmuffs are a good idea. Some people might be wishing that the vac could also be powered by AC, but I think that would have compromised the design a bit. Even if the power conversion circuitry didn’t take up any space, where would the power cord or extension cord port go? 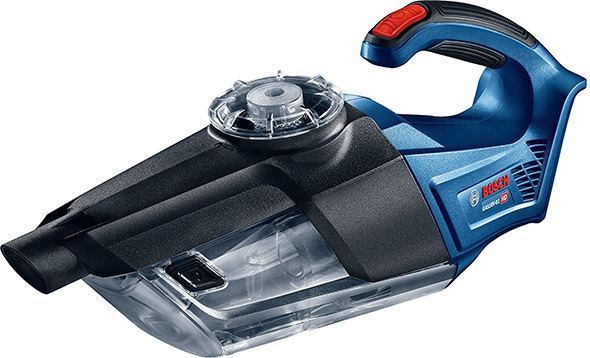 This is a tidy and capable cordless vac, and its design simply works. 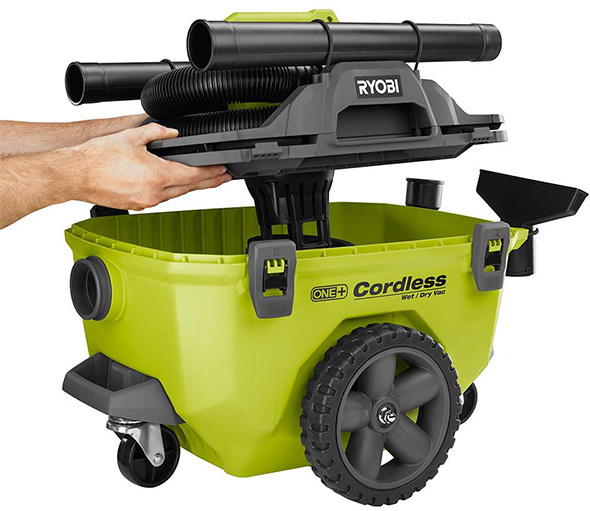 While not compact, it’s certainly more compact than a corded shop vacuum of the same size, and is far better at on-board accessory storage. I’m not in love with the included hose size or accessories, but they seem to work well with this vac, and the vac does allow for other hoses and accessories to be used. I might just have to buy an adapter, to be able to use other accessories or attachments with the included hose and extension wands. Thank you to Ryobi for providing the test sample unconditionally. I’d be interested to know how performance compares to the old p3200 model wet/dry vac. I see this new one has 1 7/8 hose vs 1.25 on the old model, but if it doesn’t really have better suction and runtime, it doesn’t seem worth it to upgrade. It’s a lot more powerful than the 3200. I’m really happy with mine. It’s not quite as strong as my normal shop vac but I’d definitely say it’s closer to the shop vacs power than that of the old P3200. I’m running a sample as well thanks to the folks at Ryobi and I am 100% in line with your first take. It’s nice and compact, convenient to use and the stow away storage is great… but the hose needs a definite upgrade. For quick clean ups it’s nice to be untethered, but for bigger messes I’ll use the big boys. If its still around, I can see this on my Christmas gift shopping list for next year. Maybe by then a Ryobi 6Ah or 9Ah battery will be available. I’d also be curious how you feel this compares in vacuum performance to the Dewalt hybrid 20v max model you reviewed a few years ago. 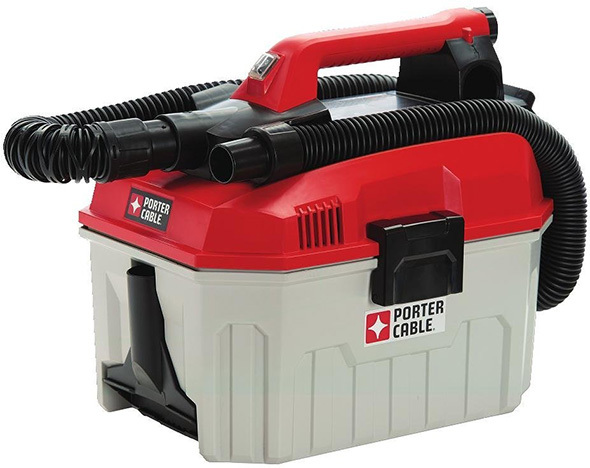 Do you feel this intended as a (light duty) substitute for a regular capacity homeowner shop vac, or more of a supplement for small cleaning jobs? The Ryobi seems to have a larger diameter hose, good for avoiding debris clogs. Interesting design, and the on board storage is a big positive for those of us who don’t have a lot of convenient storage space for accessories. It’s hard to compare, since the Dewalt is much more of a “pick up and go” model. This one is at least double the physical size, and offers more than 2x the debris collection capacity. Dewalt claims 140 CFM which seems like a lot more. Who knows in the real world though. I have the Dewalt and it’s handy, but I think they’re very different use cases as Stuart said. I predominately use mine for connecting to tools as a quick dust collection system. It’s good for small cleaning as well, but I find that the hose gets clogged really easily, limiting its use on most jobs. It’s definitely no replacement for a normal shop vac, nor is it meant to be. I might give this some serious thought . I currently have the craftsman copy of the p3200 (converted to ryobi batteries of course) but sometimes could use a Lil bigger vac preferably without getting out my big corded beast of a shop vac. This might prove to on be a nice in between. CT – How did you accomplish the Craftsman to Ryobi battery conversion? I have a lot of the craftsman 19.2 tools (Included that vac) but have been moving to the ryobi for the price/availability – care to share? I think he just meant that it’s identical to the craftsman model except for the manufacturer converting it to accept a different battery. I have had both and they were identical except for the battery. If this were hybrid-powered, I think the cord port could go next to the battery stem port, just like their other hybrid options. It doesn’t clutter up the design and also prevents users from plugging in a battery and extension cord at the same time. That would be a nice feature, especially on a battery hog like a vacuum. Bottom line is this vac does work with the Ridgid bags with no modifications needed thanks to the standard inlet, though I do find the 3-4.5 gallon bags fit a tad better than the 6-9 gallon ones; you do lose some of the 6 gallon capacity thus. Same with the Ridgid filters, they can clip onto the same post on the bottom as the included filter and sit at the same height on the motor housing, and testing with drywall dust they worked just fine. Both filters though are about 1/2″ below being snug with the motor housing, so particularly with the ridgid filters that have more flex in their bottom where the peg goes, I’ve been putting them on the motor housing rather than using the bottom peg. This negates the cleaner/easier cleanup by having the filter stay with the collection bin, but my $0.02 is I trust that more than using the peg, at least with the ridgid filters. Ridgid filters are a little more girth-y than the included one, but they fit just fine. I’m currently running mine with the 3-4.5 gallon bag and a Ridgid HEPA filter, and I have no complaints! The 1 7/8″ ridgid accessories all work with the vac fine, as do the same 1 7/8″ Workshop brand ones on Amazon. The standard Ridgid 1 7/8″ hose does seem better than the included one, so if you dislike the hose, either that or the more expensive Ridgid 1 7/8″ pro grade hose are good upgrades. Since mine is in my detached garage, the auto detailing hose is I think what is going to live on it, though it also works with the long 14′ Ridgid hose I have out there as well, and doesn’t seem to struggle with the added hose length. I like that this vac can use bags – we have a couple of acres so going outside to dump a bagless vac is less of an issue. For certain tasks you probably don’t want to dump the vac contents – so having the bag option is great. I wonder if “standard hose port” is the 2 1/2″ size? One thing I like about the Milwaukee M18 2 gal vacuum is the blowing feature. I put a dust mask on then I can blow the filter clean. As well as blowing the dust off the vac after dumping it. The Milwaukee’s noise sure is a negative. 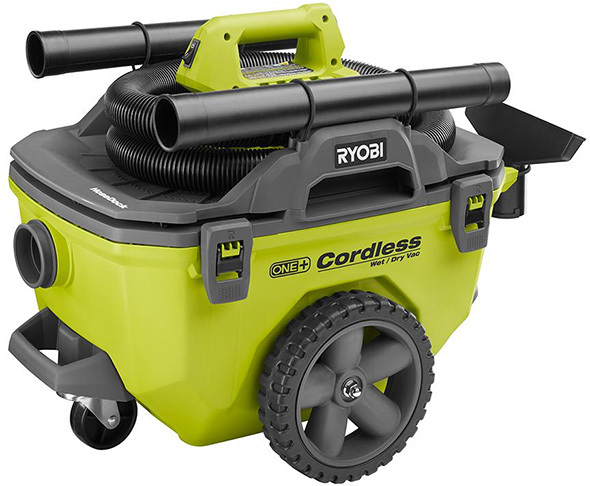 For shore power Ryobi should have done like they do with their transfer pump – use an external 18 V adapter to step the mains power down to 18 V.
An interesting science project could be to use the top of a dead One+ battery and wire it to a 3 pin male connector like is on the transfer pump. Yeah that’s the thing that dampened my enthusiasm for what seems like an otherwise excellent vac… I use the blower port about as often as not on my hd bf special from last year. I dearly love my Ridgid cordless shop vac. It’s not much bigger than my walk around tool kit, it works long enough to clean up any mess I might make on little odd jobs. The filters are cheap and rated for getting wet. It’s easy to clean out. But best of all, it’s pretty quiet. I can run it under someone’s desk without making the whole room unusable because of the noise. If it’s cordless, it should be easy to carry around. What’s the weight like? I replaced my 6 gallon Ridgid with this Ryobi a few weeks ago and have zero complaints. The Ryobi claims more CFM (80 vs 67 for the Ridgid) and it definitely feels like it. I keep it in the garage and for the remodel project I’m working on, it’s perfect. No cords, just grab it and go. $99 is a steal in my opinion. Also adding AC power might have drove up the cost. I think its easier to do on low draw applications a hybrid solution over say something that draws more amps like a vacuum. That’s just from watching a few AvE videos. Is this “un-clunky” enough for quick and easy car detailing? I, too, am interested on your thoughts for car detailing. My condo garage has no electric available so a 18v to 20v cordless vacuum for cleaning my cars is becoming a priority. Thanks. Love all the cool consumer stuff Ryobi has been coming out with lately. I bought into their platform for the Bluetooth radio, fan, LED worklight, inflators, and I’ll probably pick this up as well. I even picked up the Ryobi brushless grinder cause the price couldn’t be beat. I have Milwaukee for drills, impacts, impact wrenches & sawzalls but Ryobi for pretty much everything else.